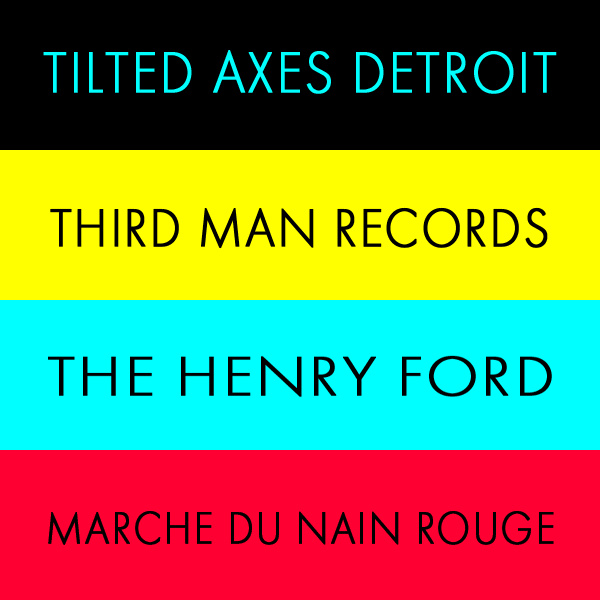 TILTED AXES is Relaunched in Detroit! 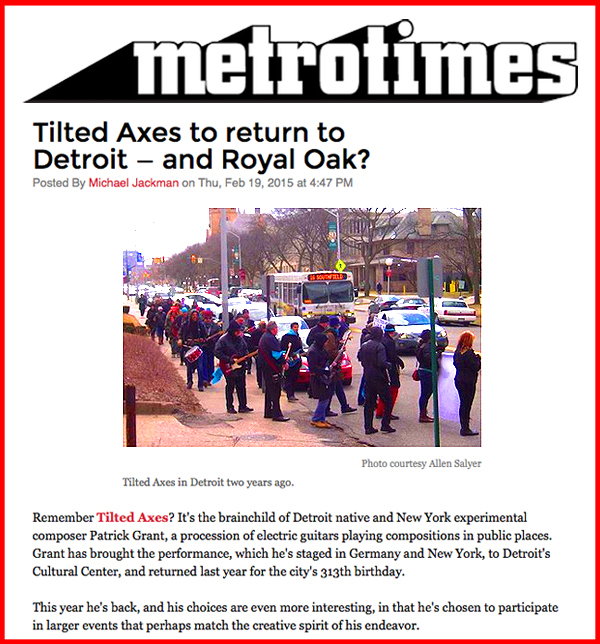 Come back for more details regarding more of Tilted Axes in Detroit soon. In the meantime, see more pics of our recent performance on our Instagram page. 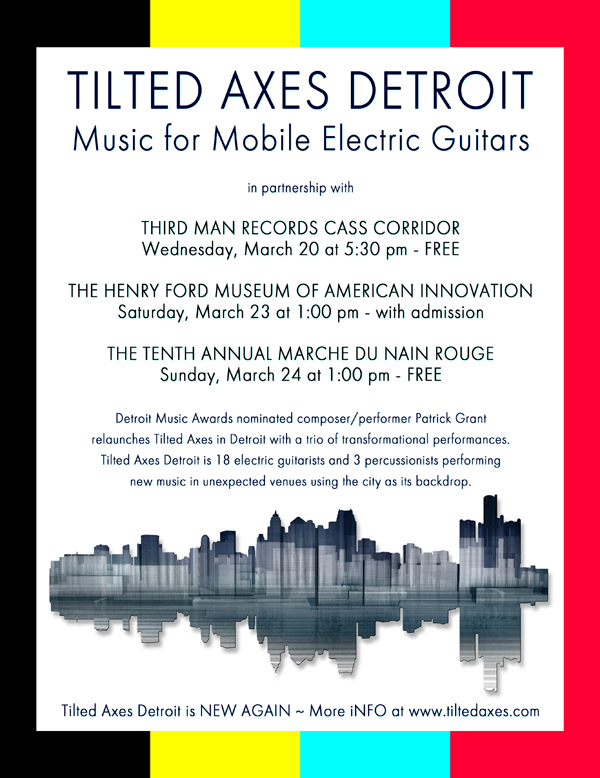 TILTED AXES DETROIT: MUSIC FOR MOBILE ELECTRIC GUITARS was created by Detroit Music Awards-nominated composer & performer Patrick Grant. 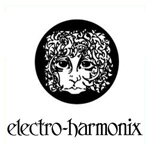 It was premiered at the 2011 winter solstice for Make Music New York and first performed in Detroit on the vernal equinox 2013. The project’s last area performance was at the 2015 Concert of Colors. 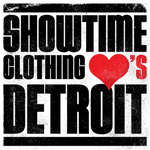 This series of performances marks its Detroit relaunch. It’s new again. 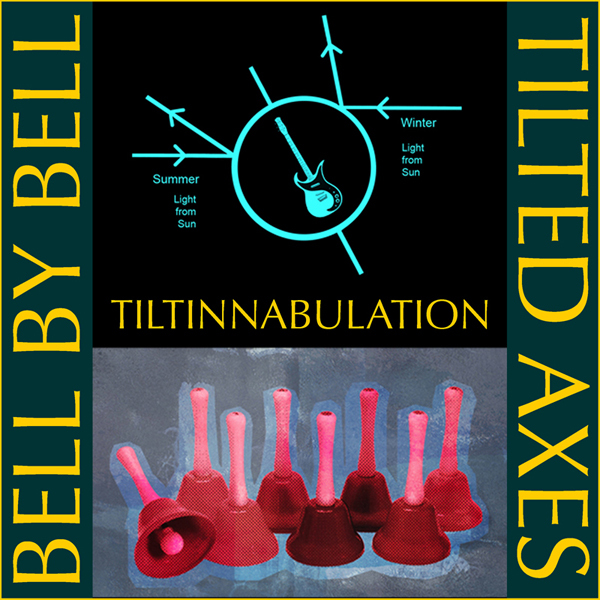 Tilted Axes events are *transformational* projects. Transformational projects are ones of such scale and scope that they can change the way a community looks at everyday things. 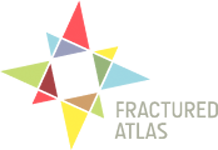 Transformational projects can change the conversation, drawing attention to new or overlooked issues, artists, or areas. Examples could be science, renewable energy, or the public place itself in which the project inhabits. Transformational projects of immensity and innovation invite audiences, intentional or incidental, to experience the work in an unexpected manner. 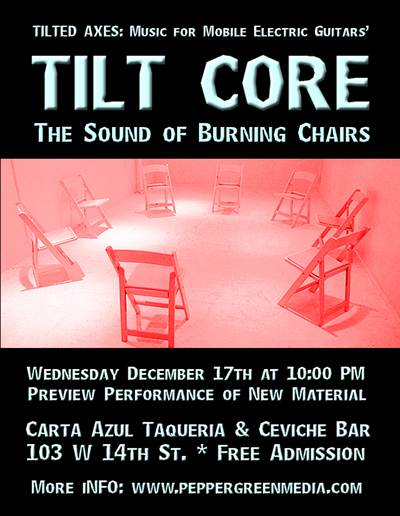 Tilted Axes’ performances are given free to the public. 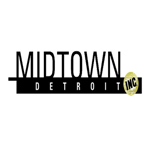 We would like to thank: Ralph Valdez, “Showtime Dan” Tatarian, Neal Cortright at DIME, The Metro Times (Jim Cohen, Jerilyn Jordan, Jeff Nutter), Paulette Epstein and Carole Wrubel from The Michigan Science Center, Ismael Ahmed at The Concert of Colors, Third Wave Music, WDET 101.9 FM, Robert Fripp and guitars circles past, present, and future, and to our numerous standard bearers, satellites, and extended family around the world who, in these uncertain times, focus on doing what’s possible (plus 10%). 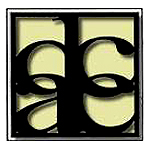 Fractured Atlas is our fiscal sponsor. Tilted Axes performances are performed and provided free to the public. 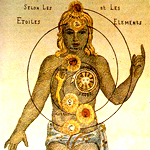 Won’t you consider making a tax-deductible contribution today for our future presentations? In the works for 2019! THE VILLAGER: "A Very Moving Symphony of Strings & Bells"
A MAKE MUSIC NEW YORK FIRST! On December 21st, as part of Make Music Winter 2018, two groups will cross paths in NYC and perform a collaborative piece together. 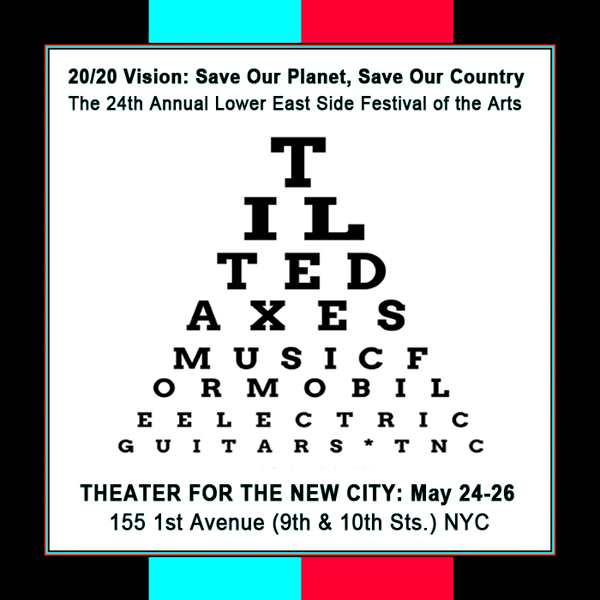 Tilted Axes: Music for Mobile Electric Guitars’ Patrick Grant and Bell By Bell’s Tom Peyton will have their groups perform at The Alamo, the Astor Place Cube, ca. 5:55 pm to ring in the new season with the premiere of a new composition, "Tiltinnabulation." 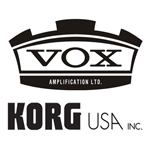 Tilted Axes' sound is powered by Vox Amps through the courtesy of our friends at Korg USA. 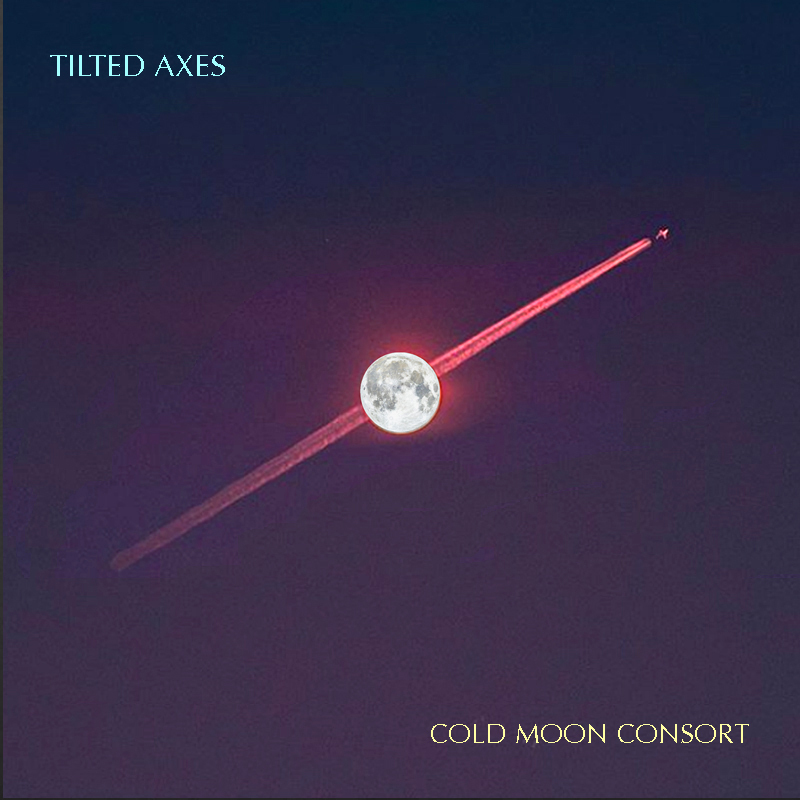 Tilted Axes thanks everyone who has made this music possible, especially NYU Faculty Housing Happenings, Aaron Friedman and James Burke at Make Music New York, and the kindred spirits at NYU Tisch School of the Arts and Alchemical Studios for rehearsal space. 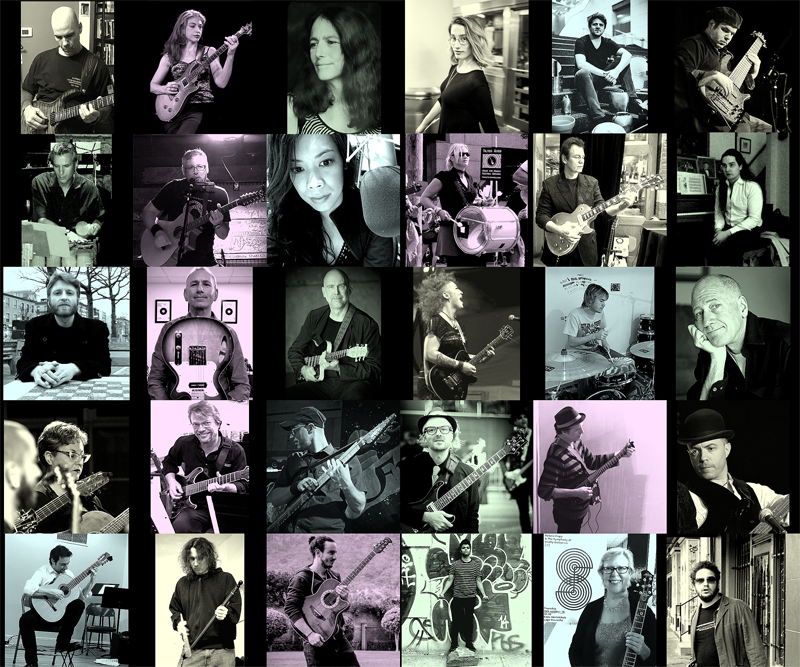 We also give thanks to Rivington Guitars for their ongoing support. 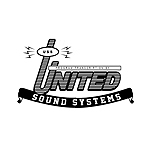 Our biggest shout-out is reserved for our numerous satellites, standard bearers, and extended family around the world who do what's possible (plus 10%). © Peppergreen Media, 2016. All Rights Reserved. 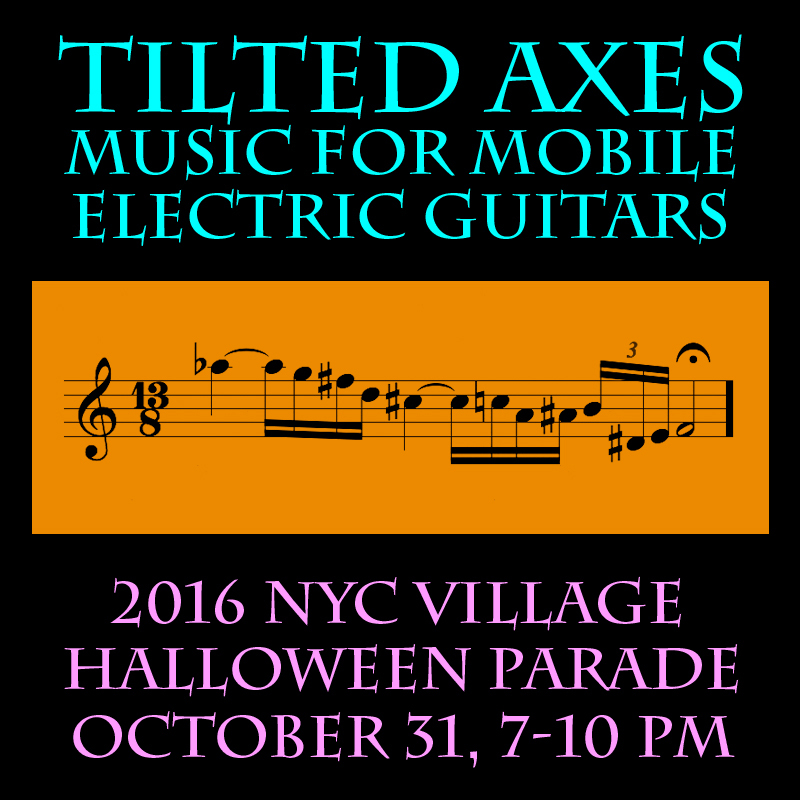 Tilted Axes: Music for Mobile Electric Guitars has been invited to perform at the NYC Village Halloween Parade as a featured act. The VHP is the largest event of its kind in the nation with an annual estimated audience of 250,000. The event will be broadcast in the Tri-State Area. 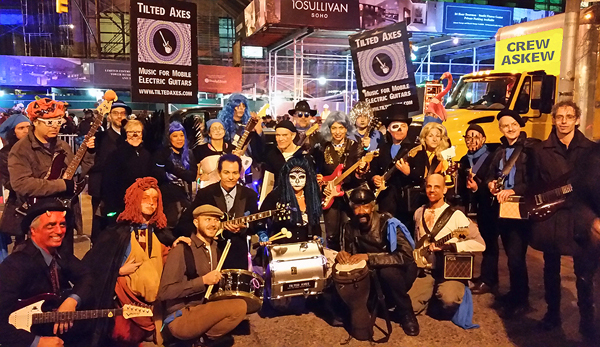 TILTED AXES' appearance at The 2016 NYC Village Halloween is made possible through the support of The NYC Village Halloween Parade, Peppergreen Media, Korg USA & VOX Amps, the ASCAP Plus Awards, and Alchemical Studios. 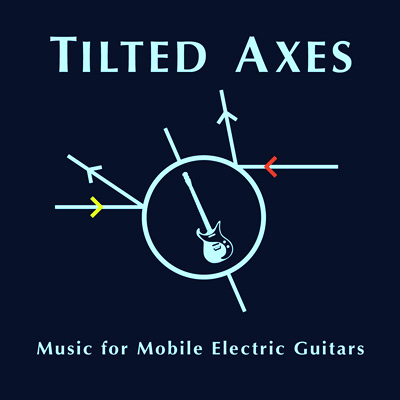 TILTED AXES: Music for Mobile Electric Guitars is a sponsored project of Fractured Atlas, a non-profit arts service organization. 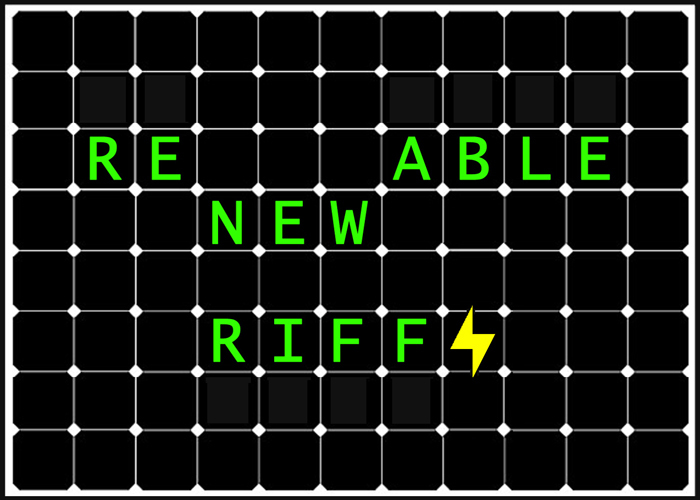 Contributions for the purposes of Tilted Axes: Music for Mobile Electric Guitars are tax-deductible to the extent permitted by law. 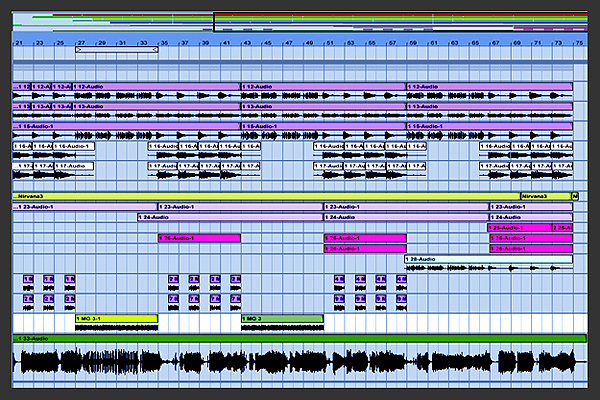 Album mastering completed. Even the building was tilted. Release news coming soon! 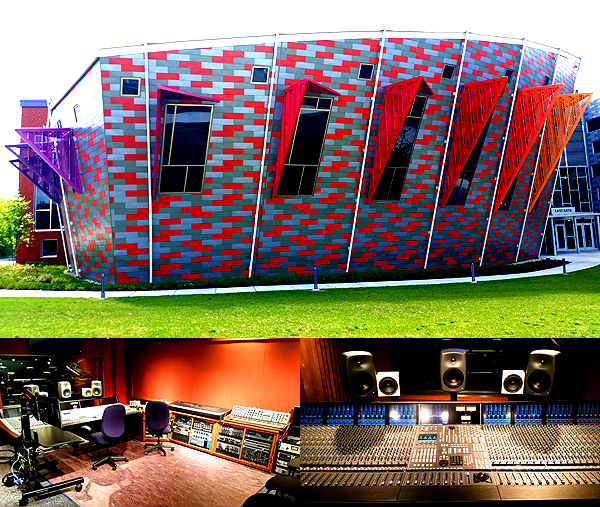 studio work and project completions of all sorts, long time coming. 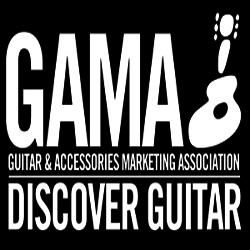 Você toca guitarra e se vê em uma apresentação diferente e única, pelas ruas de São Paulo? 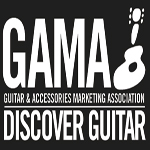 Então acesse agora mesmo o link abaixo e veja como participar da oficina 'Tilted Axes: Música para Guitarras Ambulantes', proposta pelo compositor e músico americano Patrick Grant. 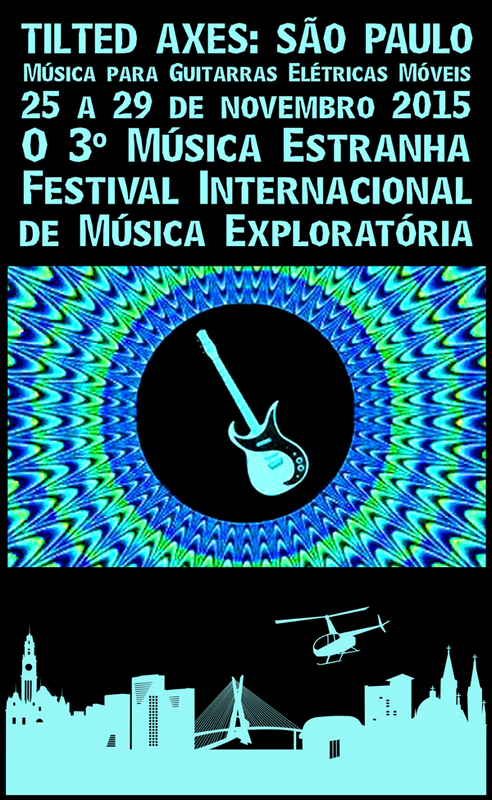 Uma combinação inusitada de música contemporânea, música para teatro e performance de rua. Inicia-se em formato de workshop, culminando em apresentações. Oficina nas manhãs de 24 até 27 de novembro, em São Paulo. Performances dias 28 e 29 de novembro, também em SP. São somente 12 vagas. Inscrições gratuitas até 14 de novembro. É bom correr! Front row: Reinaldo Perez, Natalia de Campos, Cesare Papetti, Patrick Grant, Gael S. Grant, Marlon Cherry, Gene Ardor. 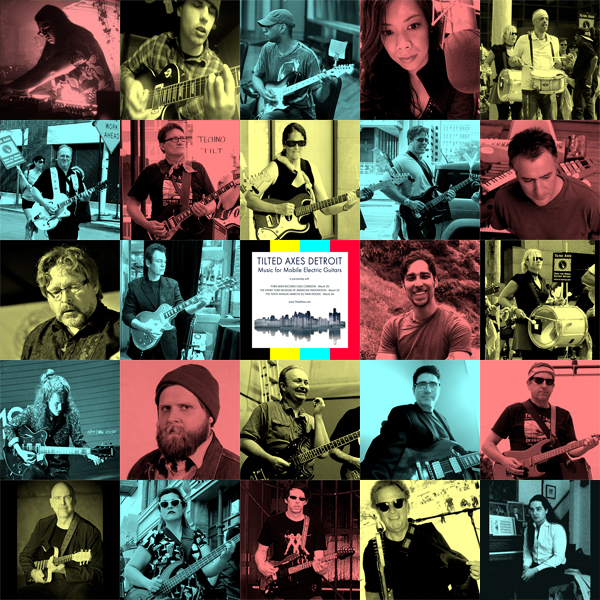 Back row: Michael Joseph, Dan Cooper, Jeremy Nesse, Leslie Stevens, Jocelyn Gonzales, Aileen Bunch, Rob Knevels, Steve Carter, John Lovaas, Angela Babin, John Halo, Kevin Pfeiffer, Sarah Metievier Schadt, Daniel Reyes Llinas, Chad Ossman, Matt Grossman. 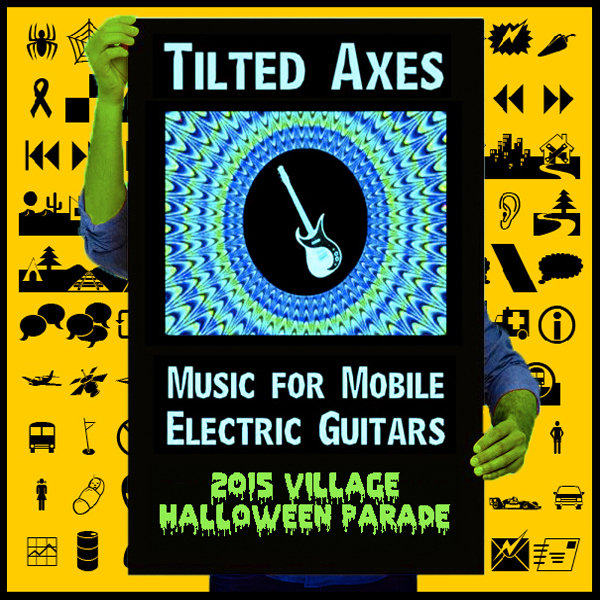 "Monster Riffs & Creepy Chords"
Tilted Axes: Music for Mobile Electric Guitars (http://peppergreenmedia.com/tiltedaxes.html) has been invited to be a part of NYC's world famous Village Halloween Parade (http://halloween-nyc.com/) and for 2015 is bringing back the classic no-holds-barred big-time Tilt. New York's Village Halloween Parade is an annual holiday parade and street pageant presented on the night of every Halloween in New York City's Greenwich Village. Stretching more than a mile, this cultural event draws two million in-person spectators, more than sixty thousand costumed participants, dancers, artists and circus performers, dozens of floats bearing live bands and other musical and performing acts, and a world-wide television audience of one hundred million. 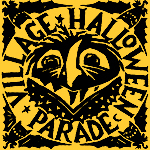 The Village Halloween Parade, initiated in 1974 by Greenwich Village puppeteer and mask maker Ralph Lee, is the world's largest Halloween parade and the only major nighttime parade in the United States. The parade has been featured in many national magazines and travel guides, and has been a subject of study by leading cultural anthropologists. According to The New York Times, "the Halloween Parade is the best entertainment the people of this City ever give the people of this City." 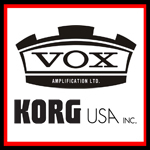 TILTED AXES' appearance at the Village Halloween 2015 is made possible through the support of The Village Halloween Parade, Korg USA & VOX Amps, GAMA - Discover Guitar, Electro-Harmonix, The ASCAP Plus Awards, and Alchemical Studios. 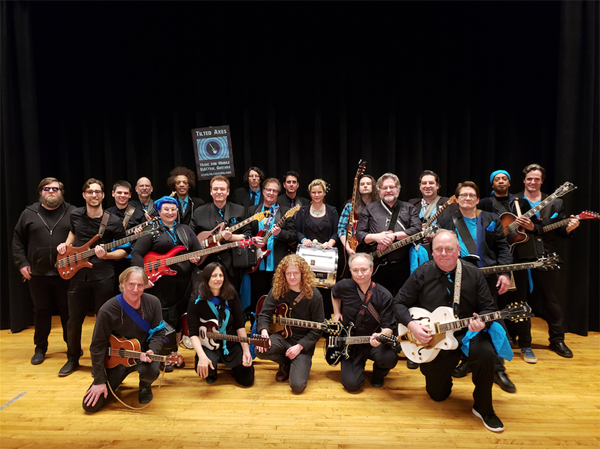 On July 11, Tilted Axes: Music for Mobile Electric Guitars will be performing and processing in the vicinity of the Wolverine Outdoor Stage from 5:00 pm to 8:00 pm. 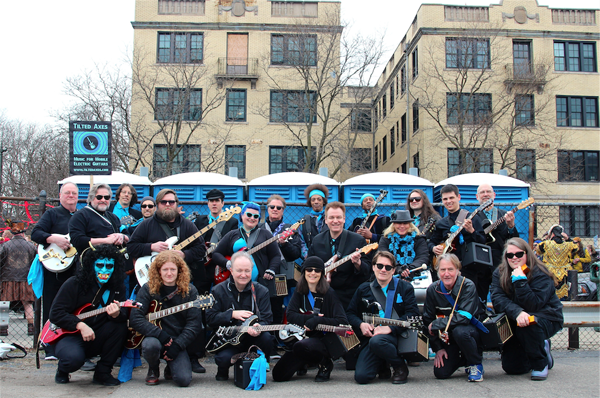 At approximately 6:45 pm, Tilted Axes will take the stage to officially premiere one of the new pieces commissioned by the Concert of Colors 2015. 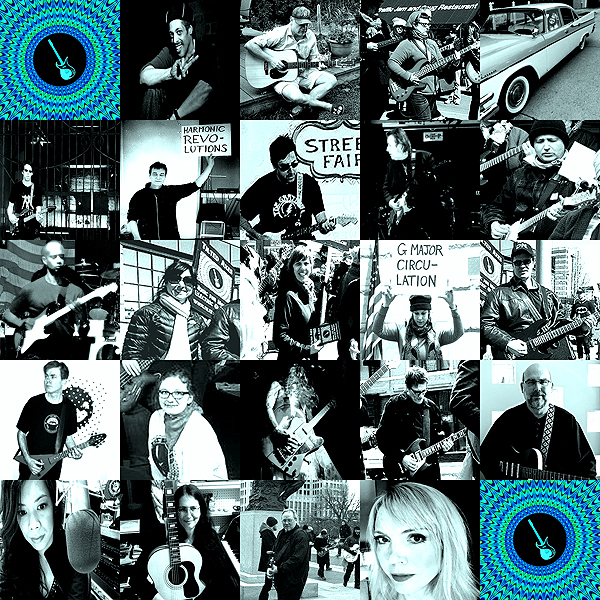 On July 12, Tilted Axes: Music for Mobile Electric Guitars will be performing and processing in the vicinity of the Wolverine Stage from 3:00 pm to 5:00 pm. A special finale is being planned for somewhere in the neighborhood. 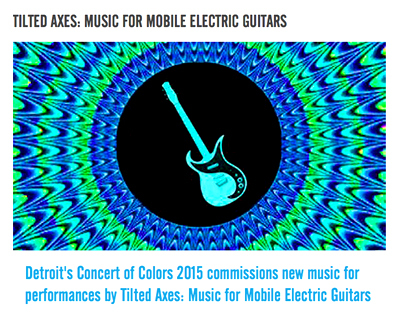 TILTED AXES' appearance at the Concert of Colors 2015 is made possible through the extra support of The Dearborn Community Arts Council, GAMA - Discover Guitar, Korg USA & VOX Amps, Midtown Detroit Inc., Showtime Clothing Detroit, United Sound Systems Recording Studios,and the ASCAP Plus Awards. 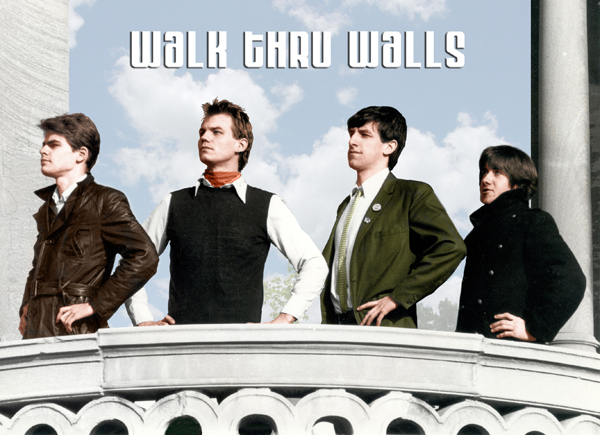 TILTED AXES DETROIT members Eric Iverson, Patrick Grant, Jude Closson, & Dean Western reform the original WALK THRU WALLS new wave band as part of the DON WAS DETROIT ALL-STAR REVUE 2015 CONCERT. 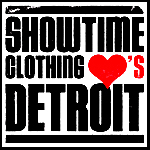 This year's revue honors 80s Detroit radio personality THE ELECTRIFYING MOJO whose on-air journey of musical and social development shaped a generation of music-lovers in Detroit and throughout southeastern Michigan and Canada and was of importance to the development of Detroit techno. 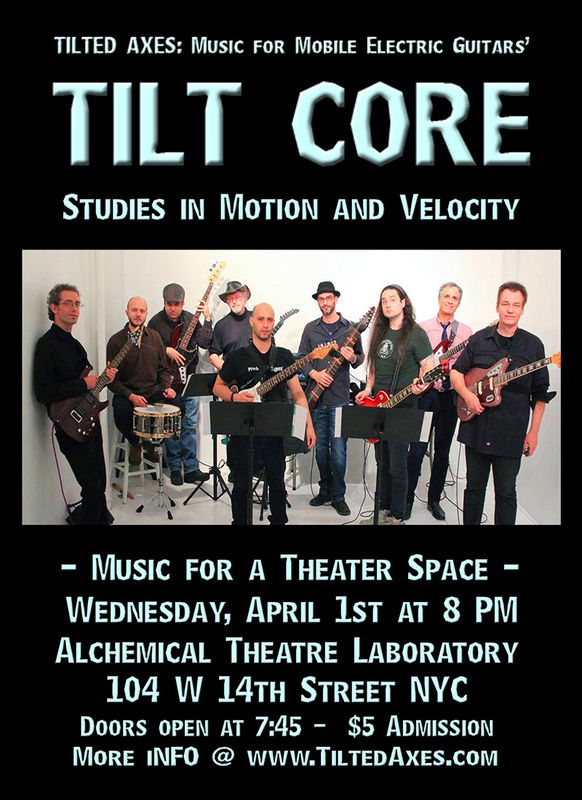 TILT CORE is an ensemble drawn from the larger group of NYC performers in TILTED AXES: MUSIC FOR MOBILE ELECTRIC GUITARS as a means to explore and experiment with new material. Its smaller size, 5-9 members, enhances musical and practical possibilities. 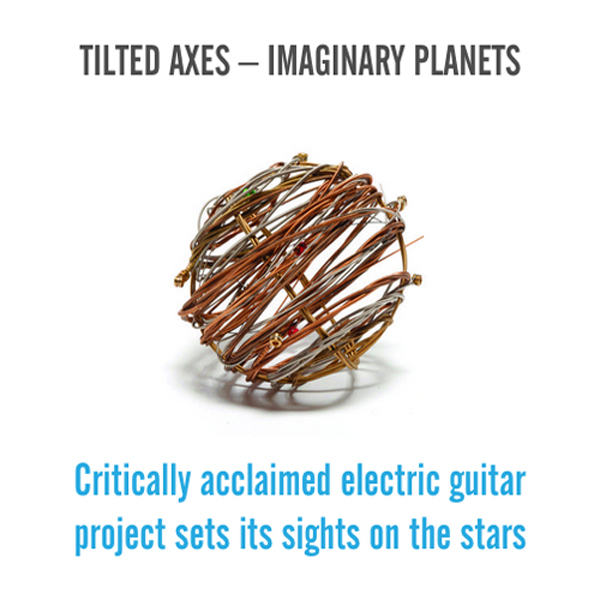 Outside of the larger processional projects, Tilt Core is a more agile and easily presentable ensemble as well a its members serving as the creative catalysts for future Tilted Axes work. STUDIES IN MOTION & VELOCITY is a performance inside of a theater. 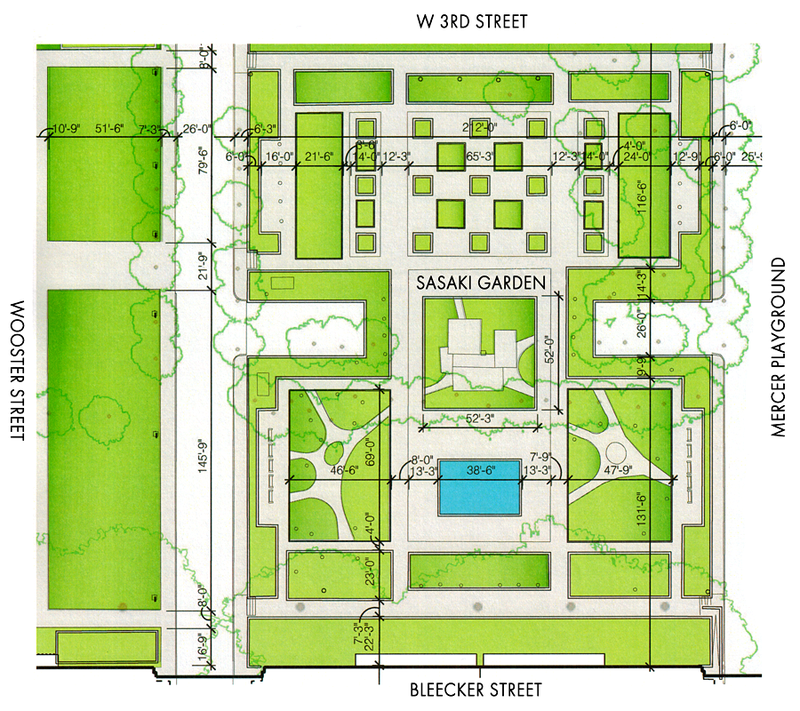 This gives the group an opportunity to use the space in a combination of mobile and stationary formations. They will perform new music as well as other pieces from the Tilted repertoire in the form of a narrative. This is the challenge. This year he's back, and his choices are even more interesting, in that he's chosen to participate in larger events that perhaps match the creative spirit of his endeavor. 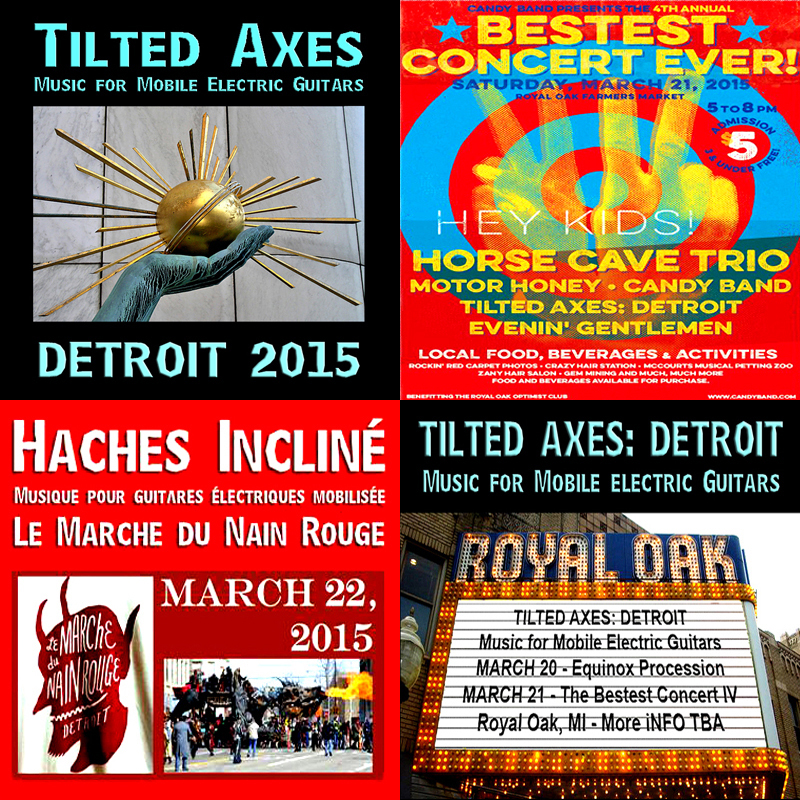 The axes will be rocking in the Detroit area for three days this March, including March 22, at the Marche du la Nain Rouge (this iteration of Tilted Axes will become the decidedly Francophone "Haches Incliné"), adding to the insurrectionary spirit of the event. His schedule also includes the Bestest Concert Ever IV, on March 21, at the Royal Oak Farmers Market, and something called the Equinox Procession in downtown Royal Oak on March 20…"
TILT CORE is an ensemble drawn from the larger group of NYC performers in TILTED AXES: MUSIC FOR MOBILE ELECTRIC GUITARS in 2014 as a means to explore and experiment with new material. 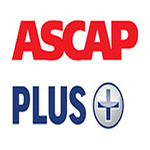 Its smaller size, 5-9 members, enhances musical and practical possibilities. Outside of the larger processional projects, Tilt Core is a more agile and easily presentable ensemble as well a its members serving as the creative catalysts for future Tilted Axes work. 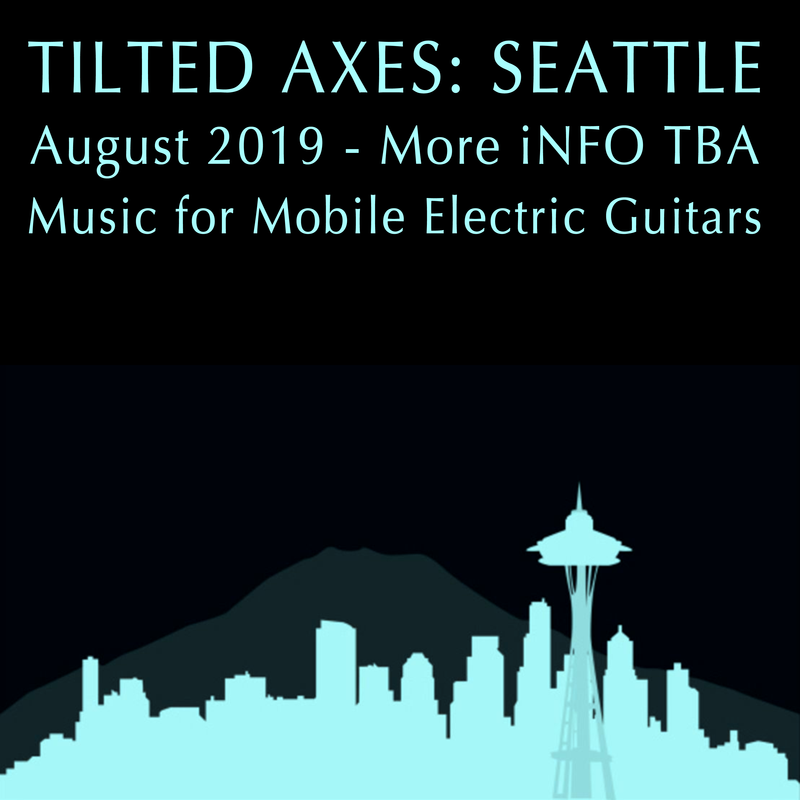 The process is simple: When a festival or other institution wishes to stage a Tilted Axes event, a call is put out to local guitarists to apply to participate. When an ensemble is selected from the applicants, they are given via MP3s and PDFs the music to be performed at the event so they can learn it in advance. 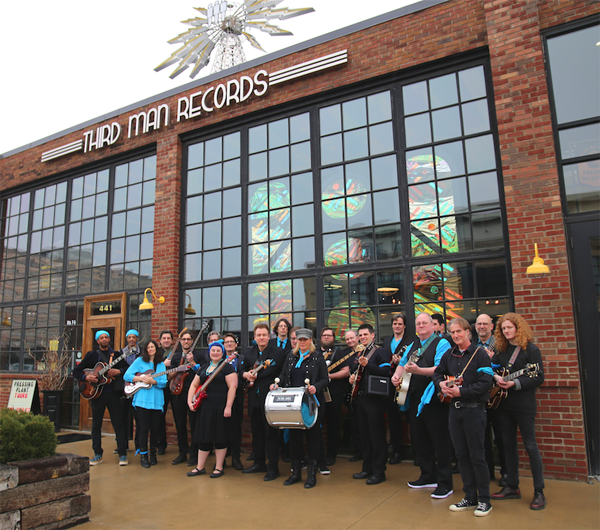 A week before the event, Grant arrives with members of Tilt Core (see below) and rehearses the local musicians in the various techniques of musical performance, improvisation, and staging that make up the procession itself. 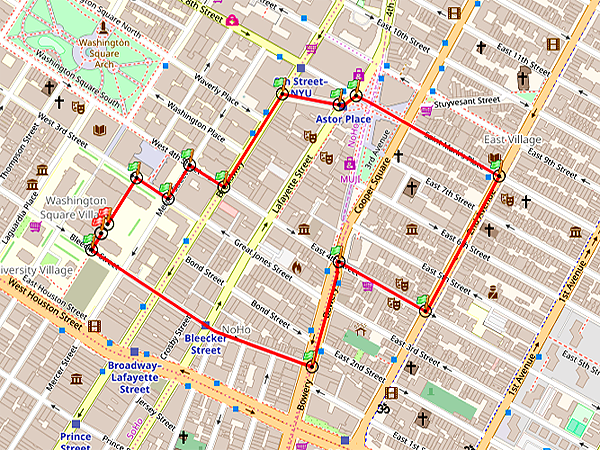 A procession route within the host city is predetermined. 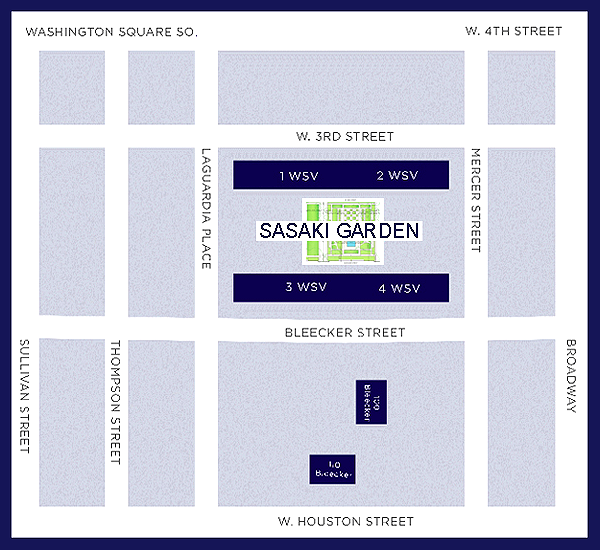 The routes often include city squares, centers of transportation, and indoor structures like museums. The procession is accompanied by posters and placards which let the public know more about the event, sponsors, the hosting organization, and its purpose. 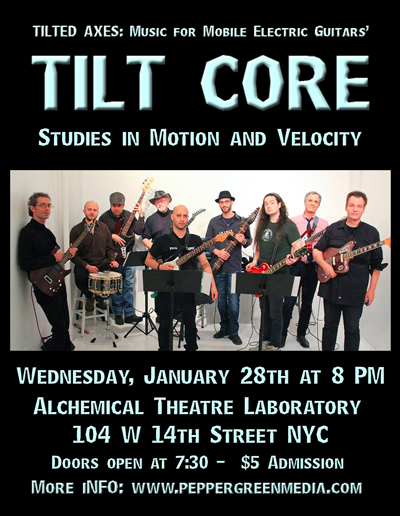 TILT CORE is an ensemble drawn from the larger group of NYC performers as a means to explore and experiment with new material. Its smaller size, 5-9 members, enhances musical and practical possibilities. Outside of the larger processional projects, Tilt Core is a more agile and easily presentable ensemble as well a its members serving as the creative catalysts for future Tilted Axes work.